Before you select your tour, it is important to understand the geological differences in our various destinations. We recommend reading this page as a precursor to submitting your reservation. This way we can ensure that you are booking the right tour for you! 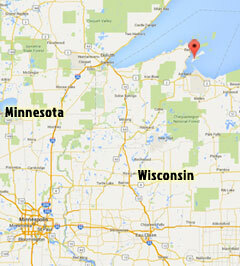 The Apostle Islands are a geologically rich area. The entirety of the Lake Superior region has undergone drastic change over the last billion years due to sandstone deposits, changing climatic conditions, and extensive glaciation. The last of the great Ice Age glaciers moved out of the area just 12,000 years ago, leaving us with the landscape we have today – rich sandstone formations, dunes, old-growth forests, and red clay till soil. The rocks in the Superior Upland of Wisconsin are separated into three main components deposited over the last 2.6-1.6 billion years. This is an area known as the “Cambrian Shield,” as it once formed mountains that separated the early continent. Today we have the remnants of these mountains and rich sandstone deposits. Two of these sandstone deposits – Chequamegon and Orienta – were deposited by streams running into the Superior basin. The third – the Devils Island formation – is formed of many layers of sand-flats that were periodically covered by water. The different methods of deposit, as well as differing climatic conditions after the sediments were deposited, leads to very different types of rock. 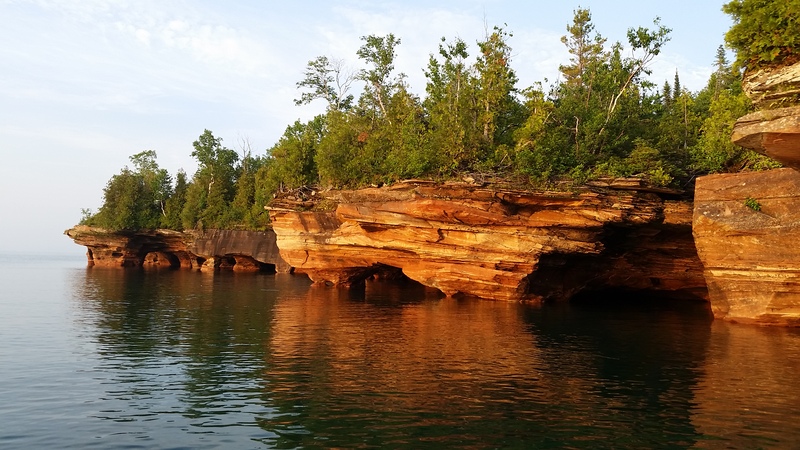 It’s important to recognize the differences in geological formations when planning your tour to the Apostle Islands. While all the formations are striking in their own right, the different types of sandstone have distinct appearances and characteristics! The first type of sandstone – the Chequamegon formation – is located on Madeline Island,most notably in Big Bay State Park and on Stockton island. The Chequamegon formation is sturdy enough that it was once quarried to build the ci ties of the Midwest. It has a pinkish-gray hue and is distinctive for its low-lying caves and smooth cliffs. 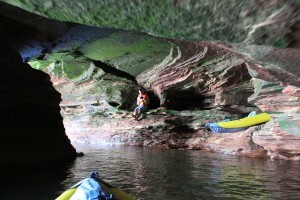 While paddling through the Chequamegon formation, one can clearly see the dynamic nature of this geological phenomenon. Rocks that have fallen due to winter ice leave telltale patches of clean, pink cliff and can be seen rising from the water. On Stockton Island it’s also possible to see sea stacks – towering pillars of Chequamegon sandstone standing apart from the island. To see this formation, reserve a spot on our Big Bay Kayak tours or take a 4-hour boat and kayak tour to Stockton island. Next on the list is the Orienta formation. We explore the Orienta formation on Sand Island with our 5-hour tour. These caves are distinct from the Chequamegon formation. Instead of pink and gray, the Orienta sandstone creates dramatic orange caves that tunnel into the island. These caves are slightly taller than the Chequamegon, being more exposed to the rest of Lake Superior and being composed of a softer sandstone. 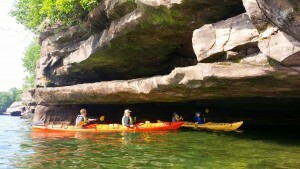 These caves are incredibly popular and make for excellent kayaking. Its easy to dip in and out of the orange formations and paddle from one cave directly into the next! To see the Orienta formation, take our 5-hour boat and kayak tour to Sand island! The most extensive and dramatic caves are from the Devils Island formation. The Devils Island sandstone is extensive, incredibly soft, and located on the north side of Devils Island, leaving these caves exposed to the entirety of Lake Superior. This has created an extensive tunneling network of red-banded sea caves along the northern coast of Devils Island. The cave network is so extensive the wind howls through them at night, giving the island its name. These caves are marked by a “ribbon” pattern. It’s easy to see the layers of sand that were periodically compressed by shallow ponds to form this layer of rock. 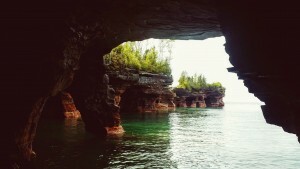 These caves are the jewel of the Apostle Islands. Reserve one of our 3, 4, and 7-hour tours to see the Devils Island formation.